For people who love to celebrate the arts, there seems to be no end to the number of televised award programs. But even in the now, dense field of entertainment award shows, the NAACP’s Image Awards still manages to entertain and inspire. Last month, the organization announced its nominees for the 44th annual show set to air February 1st on NBC. Some of the nominees are familiar faces (Denzel Washington, Usher and Halle Berry) while others are new, but show exceptional potential (Suraj Sharma, Emayatzy Corinealdi, and Gary Clark, Jr). The NAACP, thanks in part to a push by the late Willis Edwards of the organization’s Los Angeles branch, was able to bring the award ceremony to national television in 1982. In 2007, the award ceremony jumped the final hurdle and became a live broadcast. “The Image Awards are more than just a ceremony, but an institution for artists of color,” stated Leonard James, III, Chairman of the NAACP’s Image Awards Committee. “From its beginnings in a room at the Beverly Hilton hotel to its current prominence on primetime broadcast television, this event has helped showcase some of the greatest performers in our nation.” Throughout their 44-year history, the awards have stood out as a reflection of the people’s will. It is the NAACP membership that determines who will take home the coveted prizes at the end of the night. “Our nominating committee of 300 industry professionals and NAACP leaders selected nominees from over 1236 submissions this year,” stated James. “Submissions came from artists, managers, publicists, production companies, record labels, studios, networks and publishers. Now our NAACP members will be asked to vote for who will win.” NAACP members are asked to vote on nominees based not only on the performance as an artist, but whether the performance rejects stereotypes and places people of color in a positive light. For the first time, the 300,000 plus NAACP members will cast their votes online. The voting began January 4th and closes January 24th. (link to page) 2013 also brings new producers to the show. Industry veterans Reginald Hudlin and Brad Lachman have been named co-executive producers of this year’s show. “Reginald Hudlin and Brad Lachman are two of the most distinguished and well-respected producers in the industry,” stated Chairman, NAACP National Board of Directors, Roslyn M. Brock. “We are thrilled they will be at the helm of this year’s live broadcast of the Image Awards.” As the Image Awards continue to grow and evolve the principals of social justice remain at its core. Each year, the NAACP’s Chairman and its President recognize two individuals or groups for special achievement and distinguished public service. The recipient of this year’s Chairman’s Award is Vice Admiral Michelle Howard, the first African American woman to command a Navy Ship. And the recipient of the President’s Award is Actress Kerry Washington, the first African American woman to play a leading role in a primetime drama on network television in 40 years. Past honorees include TV One Founder Cathy Hughes, the Black Stuntmen’s Association, President Bill Clinton, Soledad O’Brien, Ruby Dee, Muhammad Ali, Van Jones, U.S. Surgeon General Dr. Regina Benjamin, Tyler Perry, Dr. Wangari Muta Maathai, Aretha Franklin, Bono, then-Senator Barack Obama and The Dave Matthews Band. This year’s nominees will be announced in the coming weeks. Even if your favorite actor, singer or writer did not make the cut to become a nominee, history suggests that fans of the arts looking for excitement, emotion, and inspiration will not be disappointed when they tune in to the 44th Image Awards. The first is the Logo for the 44th Annual Awards. The second Is Octavia Spencer, who won an Image Award last year for the Help. 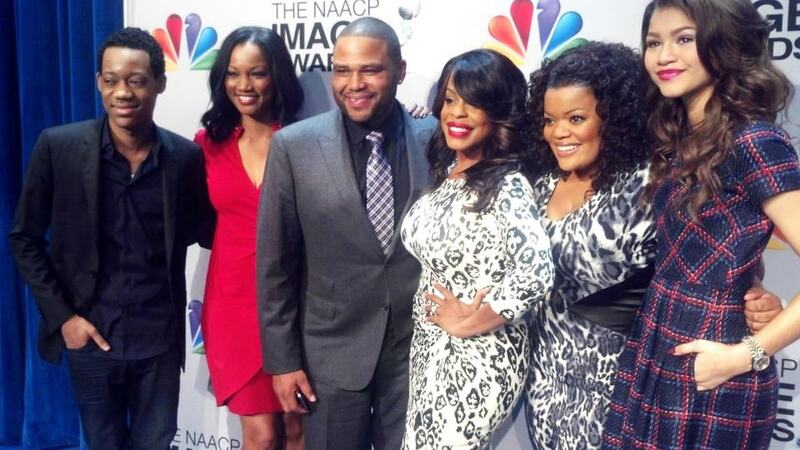 The third is Tyler James Williams, Garcelle Beauvais, Anthony Anderson, Niecy Nash, Yvette Nicole Brown and Zendaya (from left to right) at the NAACP 44th Image Awards nominee press conference. — at The Paley Center for Media in Los Angeles.